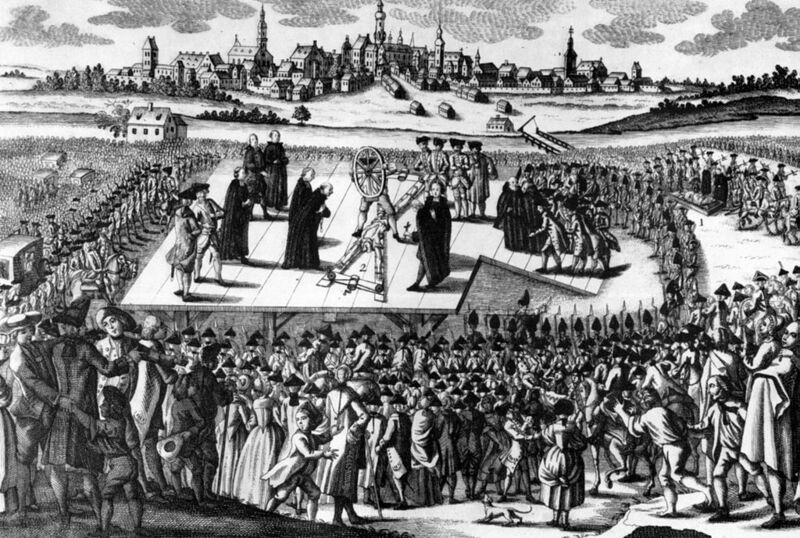 On this date in 1771, the German outlaw Matthias Klostermayr was broken on the wheel in Dillingen. The “Bavarian Robin Hood” (English Wikipedia entry | German) led a band of poachers (their merriness or lack thereof is unrecorded) who in the 1760s did a famous business, exploiting the jigsaw of tiny statelets in the region to keep the heat off by ducking across a border every few weeks. Their exploits zestily raiding the hated private hunting preserves of haughty lords elevated them in the popular imagination to social bandits. They’re really said to have distributed a portion of their booty to the poor. They were slated with nine homicides during their run, of game wardens or soldiers whom they did not hesitate to handle much less generously. The gang’s long run proliferated legends multiplying their prowess, even crediting them with supernatural powers like invulnerability to bullets. Klostermayr was the subject of folk songs even in his lifetime, and that exposure meant that he eventually became the subject of multilateral coordination among the principalities whose limited jurisdictions he so expertly exploited. 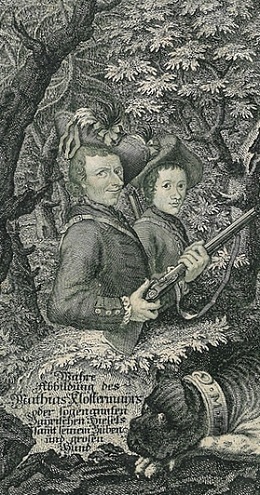 A 1769 mutual-assistance arrangement permitted authorities to cross the border in hot pursuit; by the end of 1770, an outright military expedition with 300 troops had been arranged. They took Klostermayr by storm on January 14, 1771 in the town of Osterzell; the theater and the shooting club still carry Klostermayr’s name in Osterzell, a small testament to the robber’s enduring popularity two and a half centuries on from his death. That death was bound to be a demonstrative one, revenging all the offenses Klostermayr had done to his superiors. The agonizing public shattering of his bones on the breaking wheel, preserved for us in graphic drawings, did no disfavors to the bandit’s fame. Buttressed by his thinly-veiled appearance a few years later as the protagonist of Schiller‘s first play, The Robbers, Klostermayr’s renown persists in Germanophone Europe right down to the present day. 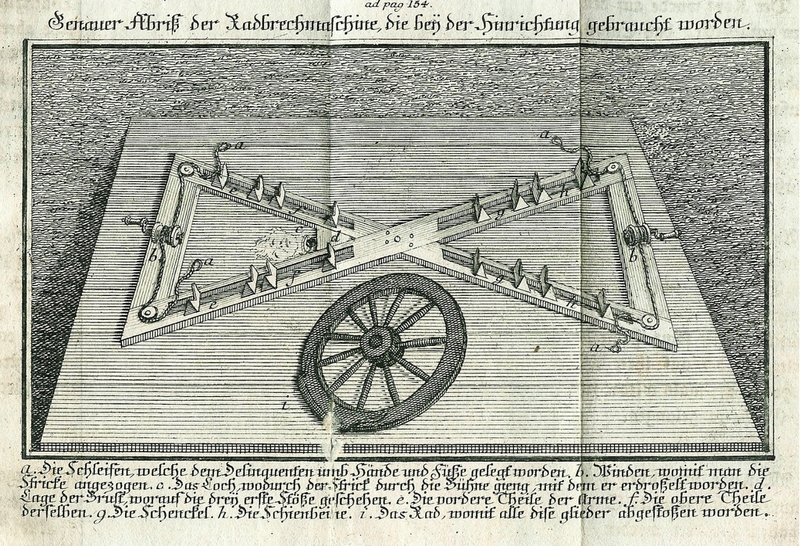 Detail view (click for a larger image) of the terrifying device on which Bavarian outlaw Matthias Klostermayr was stretched out to have his limbs crushed with a breaking-wheel on September 6, 1772. 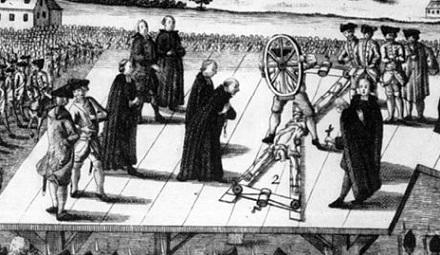 Detail view (click for a larger image) of Matthias Klostermayr being broken on the wheel.